These double chocolate cupcakes were requested by my daughter Mia for Valentines Day. Thank goodness I baked and decorated them yesterday morning! With the frequency of load shedding these days it would not have been possible to make them today! Line a medium muffin tin with paper cupcake wrappers and grease them with non-stick cooking spray. Beat the sugar and eggs together in a mixing bowl. Pour the batter into the cupcake wrappers and bake the cupcakes for about 15 minutes or until the cupcake are firm to the touch and thoroughly baked if tested with a skewer. Remove the muffin tin from the oven and cool the cupcakes in the tin for 5 minutes. Beat the butter with an electric hand mixer until fluffy. Add the icing sugar, cocoa powder and vanilla extract and beat well. Transfer the buttercream icing to a piping bag fitter with a star nozzle and pipe the icing decoratively onto the cupcakes. Sprinkle the cupcakes with heart-shaped sprinkles. Transfer to a serving platter and serve. These coconut treats are quick and easy to make and is sure to impress your Valentine! Biscuit Cream Tarts, also known as Number or Alphabet Cakes, are still all the rage! These popular tarts were created by the Israeli pastry chef Adi Klinghofer and consists of layers of cookie, pastry or cake with a creamy filling between the layers and topped with anything from fresh flowers, to fruit, macarons, meringues, candy, etc. Although bark doesn’t sound particularly appetizing, this rustic looking sweet treat is quick and easy to make and can be customised to any occasion. It is the ultimate home made gift! In its simplest form, it is a thin sheet of chocolate studded with anything from candy to nuts, dried fruit, seeds and even spices. The chocolate is then broken up into uneven pieces or shards. It is called “bark” because it resembles tree bark. A true South African delicacy – crisp plaited pastries filled with a sweet aromatic syrup. 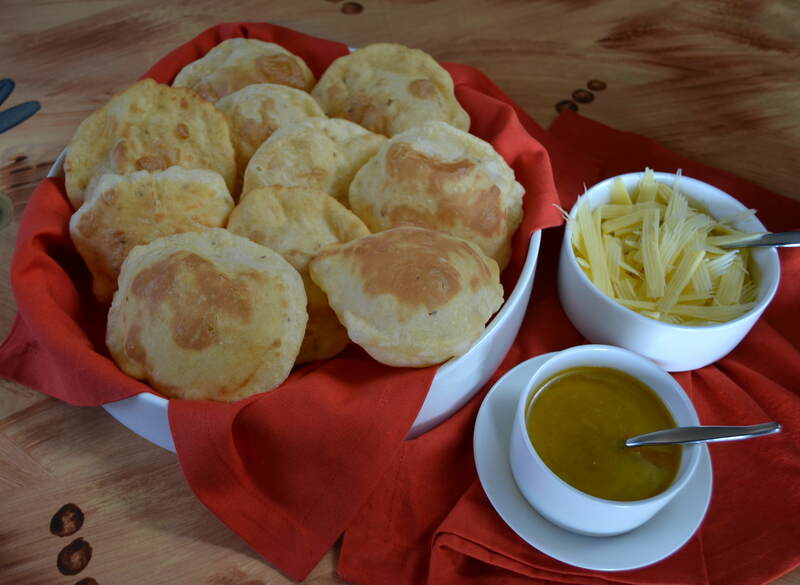 They are uncomplicated to serve at tea time or as a dessert – it is the perfect finger food! Flattish and irregularly shaped fired cakes brushed with a honey glaze are typical in Mexico and known as bunuelos. Serve as a sweet treat at any time of the day with coffee or Mexican Hot Chocolate. Combine the flour, sugar, baking powder, salt, aniseed and lemon rind in a bowl and make a well in the centre. Stir in the egg and butter and just enough of the milk to form a soft dough which can be kneaded comfortably. Turn out the dough on a lightly floured surface and knead for 5 minutes or until smooth and slightly elastic. Cover and allow to rest for 30 minutes. Divide the dough into walnut-sized portions and roll each portion thinly on a lightly floured surface with a lightly floured rolling pin to a circle of about 100 mm in diameter. Cover with a cloth until all the dough has been rolled out. Pour sufficient oil in a wide, shallow heavy-based saucepan to fill it to a depth of about 50 mm and heat to moderately hot. Fry a few rounds at a time, about 30 seconds on each side, until puffed and golden. Drain on absorbent kitchen paper and arrange in a single layer on cooling racks. Heat the honey and butter until the mixture bubbles. Cool and brush over both sides of each cake. 25 to 30 cakes, depending on size. Sprinkle lightly toasted flaked almonds over the glazed cakes. Recipe by Carolié de Koster from the Art of Cooking Recipe Book p. 752. This popular Mexican dessert reminds of the French choux pastry. The main difference is that it can be made without eggs and that it is deep-fried and not baked. It is served with a chocolate dipping sauce. You could also serve it with Mexican Hot Chocolate! To make the churro pastry combine the butter, water, salt and sugar in a saucepan. Place the saucepan on the stove and bring the mixture to a boil. Remove the saucepan from the heat and add the flour. Beat the flour into the butter mixture until a ball forms in the middle of the saucepan. Set the dough aside for 15 minutes. To make the chocolate sauce, prepare a double boiler and melt the chocolate. Add the butter, syrup, cream and chilli powder, if used to the melted chocolate and stir to combine. Set the chocolate sauce aside. To make the cinnamon sugar, combine the sugar and cinnamon in a small mixing bowl and set it aside.. Fit a piping bag with a star nozzle with a 15 mm opening. Transfer the pastry to the piping bag and twist the wide side of the piping bag to enclose the pastry. Pour enough oil into a deep saucepan to come at least 5 cm up the side. Place the saucepan on the stove and heat the oil to moderately hot. Line a large plate with double layer of absorbent kitchen towel and set it next to the stove. Carefully pipe the batter into the oil. Use kitchen scissors to cut the pastry when you have piped the desired length – they can be 4 to 10 cm. Fry the churro’s until light golden brown on all sides. Lift the churro’s out of the oil with a perforated spoon and transfer to the plate. Continue in this manner until you have used up all the pastry. 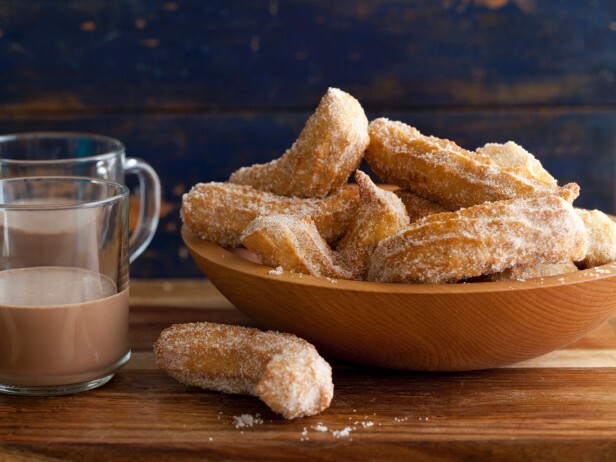 Transfer the churro’s to the plate and sprinkle with the cinnamon sugar. Transfer to a serving dish and serve with the sauce. These minty sweet treats are quick and easy to make and are great with after-dinner coffee or to give as a gift. Combine the butter and corn syrup in a large mixing bowl. Add 250 ml of the icing sugar and mix until well combined. Add the essence a few drops at a time until you have the desired flavor. Mix in the rest of the icing sugar. Turn the mixture out onto a Wizbake baking sheet sprinkled with icing sugar and knead the mixture until all the icing sugar is absorbed and the mixture is completely smooth. Add additional icing sugar if needed. Leave one portion white. Add green food colouring to the other portion a few drops at a time until you have the desired colour. Shape the mixtures into 2 cm balls and flatten gently with a fork. Let the patties stand, uncovered, at room temperature for 1 day. Dip the patties halfway in melted chocolate or drizzle melted chocolate over the patties. Set aside to set. 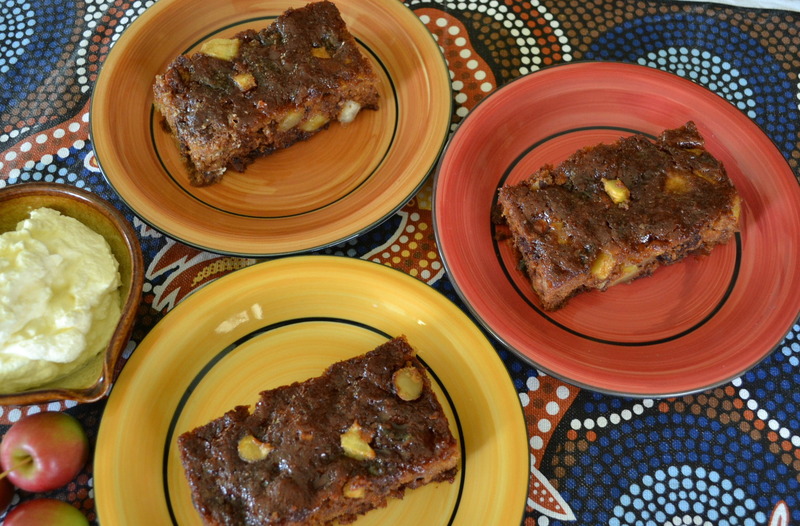 Apple is added to the traditional and cherished South African “Tipsy Tart” also known as Cape Brandy Tart and turned into the popular “slice” that features strongly in New Zealand and Australia! Enjoy with whipped cream or ice-cream or custard. Preheat the oven to 180ºC. Grease a rectangular pie dish (± 28 x 20 x 3 cm) well with butter. Cut up the dates finely and place in a mixing bowl with the baking soda, boiling water, sugar and butter. Mix thoroughly to combine, mashing the dates a little to break up and cool for at least 5 minutes. Combine the flour, gluten free baking powder, salt and spice, add the date mixture, eggs, nuts and apple and stir well to combine. 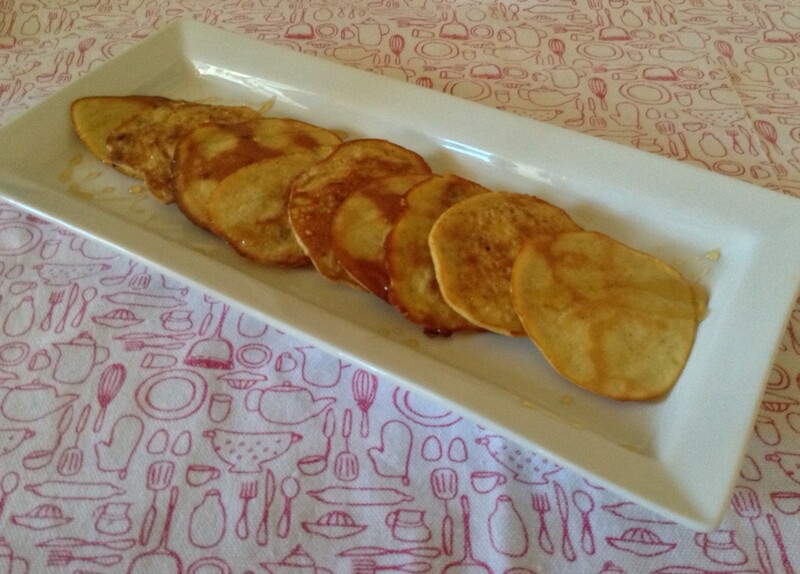 Turn the batter into the dish, spread evenly and bake 25 minutes or until firm and thoroughly cooked. Lower the temperature towards the end of baking time if the top browns too soon to prevent it from browning too much. Meanwhile, place all the ingredients for the syrup, except the brandy, in a small saucepan and stir over moderate heat until the sugar has melted. Simmer for 8 to 10 minutes or until the syrup has reduced by about ¼ . Stir in the brandy. Remove the baked tart from the oven, cool a few minutes and spoon over the syrup. Leave to stand until the syrup has been absorbed. Cut into neat slices and serve slightly warm as explained above or cool and reheat when required. Recipe by Carolié de Koster from the Art Of Cookin Recipe Book p. 507. 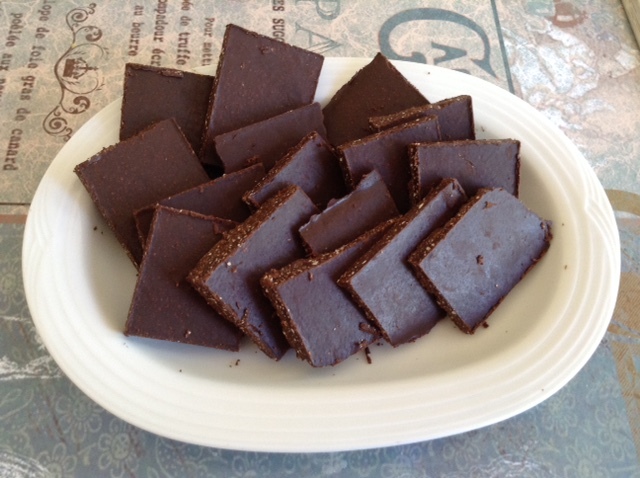 This recipe can be made with gluten free flour or gluten free baking mix. Note If gluten free baking mix is used reduce the baking powder to 5 ml (1 tsp). 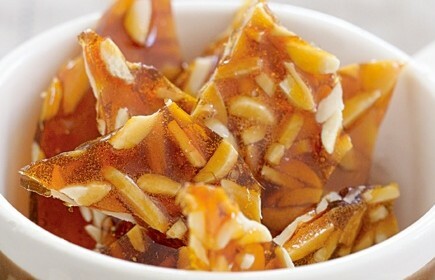 This praline recipe is for French pralines which is a combination of almonds and caramelized sugar. It is harder than American praline which is a combination of syrup, milk or cream and pecans, hazlenuts or almonds. American praline resembles fudge. See the Creamy Crunchy Sponge Cake Roll for an idea to use the Almond Praline. Or just stir it into or sprinkle on top vanilla ice-cream. To make the praline, place the butter and sugar into a saucepan and allow to melt over moderate heat, tilting the pan from side to side until the sugar has melted and starts to change colour. Add the almonds and cook while stirring until golden brown, taking care not to over cook or burn the praline. Turn out onto greased aluminium foil, spread evenly and allow to cool. Break into small pieces or crush lightly with a rolling pin. Recipe by Carolié de Koster from the Art of Cooking Recipe Book p. 568. Meringue, also known as “forgotten cookies” due to the fact that it is baked at a very low heat for a long time, is a type of dessert associated with French, Swiss and Italian cuisine. It is made from whipped egg whites and sugar as well as some form of acid, such as lemon, vinegar or cream of tartar. A binding agent such as salt, corn starch or gelatine may also be added to the eggs. French meringue is sometimes referred to as ordinary meringue at it is the most basic and the least stable until baked of all the meringues. Egg whites are beaten until they coagulate and form soft peaks, at which point sugar is slowly incorporated until the mixture has attained full volume; is soft, airy, and light; and stands at attention when the whip is lifted. French meringue is customarily spooned or piped into different forms, including dessert shells (such as vacherins) and cake layers (as in a dacquoise), and baked, later to be topped with fruit, mousse, or whipped cream. It is also often folded into batters (for lady fingers, sponge cakes, soufflés, and the like) and baked. There are actually three basic techniques for making meringue and they are differentiated by the extent to which the egg white foam is heated and the resulting stability of the meringue. The three styles are known as French, Swiss, and Italian meringues. Meringue can be used as the basis for various desserts including Baked Alaska, Eton Mess, Floating Islands (aka snow eggs), Pavlova, as a topping for Lemon Meringue Pie, and many more. Swiss meringue is prepared by gently beating egg whites and sugar in a pan that sits above boiling water, without touching it. When the mixture reaches 50°C and the sugar is completely dissolved, the mixture is pulled off the heat and beaten vigorously to increase and attain full volume and then at a lower speed until cool and very stiff. Swiss meringue is smoother, silkier, and somewhat denser than French meringue and is often used as a base for buttercream frostings. Italian meringue is made with boiling sugar syrup, instead of caster sugar. This leads to a much more stable soft meringue which can be used in various pastries without collapsing. In an Italian meringue, a hot sugar syrup (115°C) is whipped into softly whipped egg whites till stiff. This type of meringue is safe to use without cooking. It will not deflate for a long while and can be either used on pies and Baked Alaska, or spread on a sheet and baked for meringues. Preheat oven to 120°C and line baking trays with Wizbake sheets and set it aside. Place the egg whites in the bowl of a stand mixer fitted with the whisk attachment or use hand mixer and place in a large bowl. Beat until light and foamy on low speed. Turn off the mixer and add the vanilla extract. Carefully, add the powdered sugar and beat on medium speed for 20 minutes. The meringue will get thick. Add some pink food gel and fold the gel through to create a marbled effect. Spoon the meringue into a silicone piping bag fitted with a star nozzle. Pipe the meringues in circles starting in the center and swirling outward in a circular motion. Repeat until all meringue is used. Turn the oven down to 100 °C and bake the meringues for 10 minutes. Switch the oven off and leave the meringues in the oven overnight to dry out or at the lowest setting for 3 to 4 hours until completely dry. Remove the meringues from the oven and set aside to cool completely. Spread 15 ml Nutella on the flat bottom of one meringue and cover with a 2nd meringue to make a sandwich. Transfer to a serving plate or store in an airtight container until ready to serve. These coconut bars taste better than the real McCoy and are quick and easy to make! Combine the icing sugar, coconut, cream of tartar, salt, coconut essence, if used, and condensed milk in a large mixing bowl and mix well with a wooden spoon. Add a few drops of water if the mixture is too stiff. It should have the consistency of play dough. Line a 20 x 20 cm baking pan or dish with plastic wrap, leaving plenty of extra to hang over the sides. Press the coconut mixture firmly into the pan or dish and cover the coconut mixture completely with the plastic wrap before placing it in the freezer to firm up – at least 30 minutes. Melt the chocolate in a double boiler (or a glass bowl over a pot of simmering water). Set the chocolate aside. Place a Wizbake baking sheet underneath a cooling rack and set it aside. Remove the coconut mixture from the freezer, unwrap and cut into 12 bars of equal size. 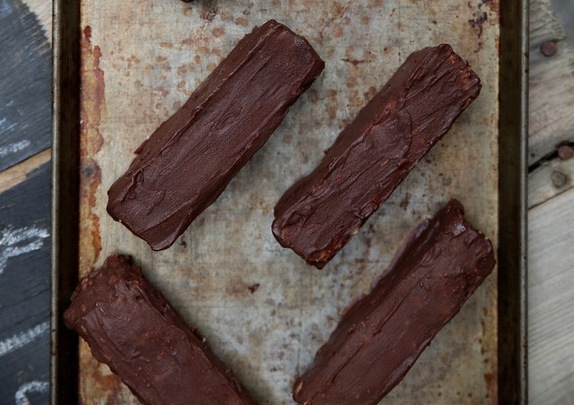 Work with one coconut bar at a time and slip it into the melted chocolate. Turn it over with a a fork to coat it on all sides with the chocolate. Remove the bar with a fork, allowing any excess chocolate to drip back into the bowl, then place it on the cooling rack so that the excess chocolate can drip off onto the Wizbake sheet. Do the same with the rest of the bars. Place the rack in the freezer for about 15 minutes so that the chocolate can harden. Remove the rack from freezer and repeat the dipping process, i.e. give each bar another coat of chocolate. Return the rack with the bars to the freezer to firm up completely – at least one hour. Remove the bars from the rack and store in an airtight container in the freezer for up to two months. Take a dark slab of chocolate to another level by adding toasted coconut, almonds and cinnamon. The perfect treat if you are Banting as it is virtually sugar-free! Add the coconut oil to the chocolate and mix well. Combine the desiccated coconut and almonds in a dry frying pan and toast it until golden. Be careful not to let it burn! Transfer the coconut and almond mixture to a food processor and process it with the pulse action until it looks like breadcrumbs. Add the coconut and almond mixture to the melted chocolate and mix well. Add the cinnamon and mix well. Pour the chocolate mixture onto a baking tray lined with clingwrap or baking paper and set it aside to cool. Refrigerate the chocolate until firm. Transfer the chocolate to a chopping board and cut it into blocks or fingers. A doughnut is a type of dough confectionery that is fried in oil. 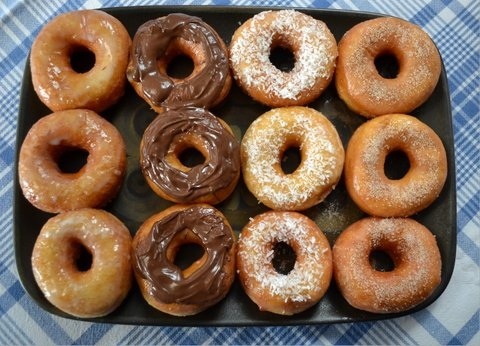 The two most common types of doughnuts are the ring doughnut, which has a hole in the center for the oil to bubble through to ensure even cooking, and the filled doughnut, which is fried and then injected with a sweet filling such as jam or cream. Be sure to read more about the latest craze, cronuts, which is a croissant/doughnut hybrid in the post Crazy For Cronuts. Place the yeast, 750 ml flour, sugar and salt in a mixing bowl. Add the milk, eggs, vanilla and butter and beat to combine. Add sufficient extra flour to form a soft, slightly sticky but kneadable dough. Turn out the dough onto a floured surface. Knead the dough about 5 minutes or until smooth and elastic. Add extra flour only if necessary. Return the dough to the bowl, cover with a plate and rise about 30 minutes or until doubled. Knead down the dough and turn out onto a floured surface. Roll out the dough to about 2 cm thick. Dip a doughnut cutter into flour and cut out rings for the doughnuts, close to each other to prevent leaving excessive dough for re-rolling. Re-roll the leftover dough and continue cutting until all the dough has been used. Place doughnuts and balls if used onto a lightly oiled tray and rise in a mildly warm protected spot until almost doubled. Take care not to rise too much for the dough rings will become too soft and loose shape when lifted to place into the oil. Mix together the ingredients for the glaze in a mixing bowl, large enough to hold a few doughnuts at a time. Allow to stand while doughnuts are rising to soften any small lumps. Pour sufficient oil into a deep saucepan to come 5 cm up the side of the saucepan and heat to moderately hot (160ºC for those who use a thermometer), when the doughnuts are ready for frying. Take care not to overheat the oil to smoking point for it will harm the oil and spoil the flavour and brown doughnuts too soon and too much without allowing time for further rising. To test the temperature of the oil, fry a doughnut or small tester ball in the oil which is still below the desired temperature and turn up the heat as necessary. Place a few doughnuts at a time into the oil and fry about 1½ minutes on each side in the moderately hot oil until light golden brown. Test for doneness with a cake tester or break open a doughnut to determine whether it is cooked. Place a wire rack over a tray to catch up glaze which drips from the doughnuts. Lift the fried doughnuts out of the oil with a perforated spoon and place into the glaze. Turn over with a large fork or tongs to allow the glaze to coat the doughnuts all over. Place onto racks to cool and allow excess syrup to drip off. Roll or dip the doughnuts immediately after coating with the glaze into coconut, chocolate vermicelli, cinnamon sugar or toasted nuts or slivered almonds. Yields 24 – 30 doughnuts, depending on size. Recipe by Carolié de Koster from Art Of Cooking page 860. High in fibre – nearly twice the amount of fibre found in wheat bran. Great for improving digestion, reducing the amount of sugar your body absorbs and lowering cholesterol. High in protein – it is higher in protein and essential amino acids than rye or cornmeal flour. Low in carbohydrates – the low-carb alternative to ordinary flours. See my post Nuts About Coconuts for more info on coconut products. Combine all the ingredients in a mixing bowl and set it aside. Heat the butter in a heavy-based saucepan, electric frying pan or griddle to moderately hot. Drop spoonfuls of the batter, well apart to allow for spreading, onto the hot surface. Cook the crumpets over moderate heat until bubbles appear on the surface. Turn over with a lifter and cook until golden brown on both sides. Place onto a cooling rack and cover with a cloth to prevent the crumpets from drying out. Serve with honey, yoghurt and/or fresh fruit. The cream and buttermilk combination is responsible for the delicate, moist texture, rich flavour and excellent keeping quality while the method used minimises the mixing time. 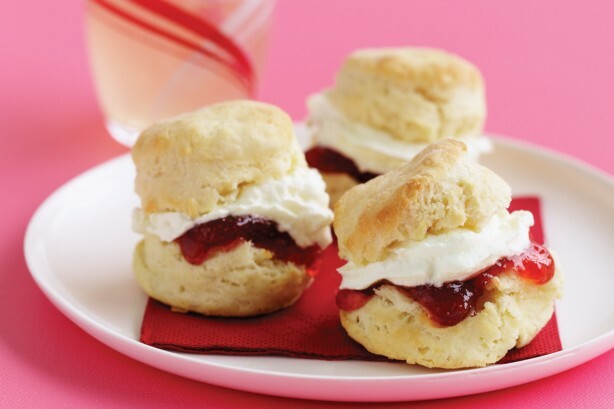 This scone recipe was invented by Marianne Palmer of the Cranemere Farm in the Karoo. Preheat the oven to 220°C and grease a medium sized baking tray with margarine. Place the flour, baking powder, salt and sugar in a mixing bowl and stir thoroughly until evenly blended. Make a well in the centre of the dry ingredients. Beat together the eggs, cream and buttermilk and reserve 30 ml for glazing. Pour the egg mixture into the well in the dry ingredients and stir with a fork until the dough holds together. Turn out the soft, sticky dough onto a well-floured surface and knead lightly with floured hands, no longer than 2 minutes. Add a little more flour if necessary to form a very soft pliable yet smooth dough. Roll out the dough on a floured surface with a floured rolling pin to a thickness of about 25 mm and cut out neat rounds with a scone cutter, between 50 – 80 mm in diameter. Place the scones slightly apart onto the greased baking tray. Dilute the reserved egg mixture with a little water and brush over the scones to glaze. Bake the scones 10 – 15 minutes depending on size until well-risen and golden. Break open one scone to determine doneness. Lift onto a cooling rack and serve while still slightly warm or allow to cool. 15 to 20 scones depending on size. The same variations will apply to any scone dough unless otherwise specified. Substitute 1/3 – 2/3 of the cake flour with whole wheat flour and continue as explained for each recipe. Add 125 ml finely grated, well-flavoured cheese, 5 ml mustard powder, a grinding of black pepper or a good pinch of cayenne pepper to the dry ingredients after rubbing in the butter or margarine. Dust the glazed scones lightly with red sprinkle mix (1/3 cayenne pepper + 2/3 paprika) or garlic and herb seasoning. Add 20 ml mixed fresh herbs or 5 ml mixed dried herbs and 20 ml each of freshly chopped parsley and green ends of spring onion to the dry ingredients. Substitute 30 ml chopped fresh dill for the herbs above. Delicious with soup such as potato soup or tomato soup. Add 500 ml finely grated well-flavoured cheese, 50 ml chopped cooked bacon or ham, 10 ml mustard powder, 30 ml finely chopped onion and 15 ml freshly chopped parsley to the dry ingredients. Increase the liquid slightly if necessary to create a soft scone dough. Dust the glazed scones lightly with red sprinkle mix (1/3 cayenne pepper + 2/3 paprika) or garlic and herb seasoning. Add 125 – 250 ml sultanas, raisins or other dried fruit to the dry ingredients after rubbing in the butter or margarine. Recipe by Carolié de Koster from the Art Of Cooking Recipe Book p. 669. 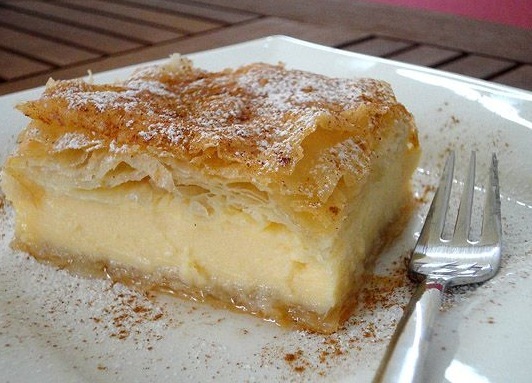 One of the most popular Greek confections which may be made as a large tart to cut into slices or as individual rolls filled with the thick semolina custard. Place the milk into a large saucepan and bring to boil. Add the semolina or wheat porridge in a thin stream, beating with a wire whisk until a smooth, thick custard has formed. Reduce heat, cover and simmer very gently for 5 minutes or until thickened. Beat a little of the hot sauce into the eggs and return to the saucepan. Bring to boil while beating and cook gently for 2 minutes or until the eggs have thickened the custard. Beat in the salt, lemon rind, butter or margarine, sugar and vanilla essence. To make the large tart for slices, brush the sides and base of a rectangular dish (± 300 mm x 200 mm x 60 mm) with melted butter or margarine. Line the dish with 6 sheets of phyllo pastry, brushing in between with melted butter or margarine and folding it in to fit the dish without cutting away any of the phyllo pastry. Pour the custard into the dish and cover with the remaining 6 sheets in the same manner, brushing in between and ending with a neat top sheet. Brush the remaining butter or margarine over the top and bake at 180 ºC for about 40 minutes or until the crust is golden and crisp, the filling has set and the pie appears risen in the centre. Or to make rolls, refrigerate the custard filling for a while to make it firm and easier to handle. Lay out one sheet of pastry at a time, brush with melted butter or margarine and spoon about 75 ml of the filling 3 cm away from the edge and in the middle third portion of the pastry (see diagram). Fold over a third of the pastry from each side, brush again with melted butter or margarine and roll up carefully but loosely to allow for expansion during baking. Place the rolls 10 mm apart into greased ovenproof dishes and brush with the remaining melted butter or margarine. Bake at 170 ºC for about 30 minutes or until golden and puffy. In the meantime, boil the syrup. Place the ingredients for the syrup into a small saucepan and cook over moderate heat, stirring until the sugar has melted. Bring to boil, reduce heat and allow to simmer for 10 minutes. Allow the tart or rolls to cool for 5 minutes and pour the lukewarm syrup over all. Cool completely and preferably refrigerate the large tart for a while before cutting it into squares or slices for serving. ± 16 servings, depending on size. Shortbread is one of my favourite biscuits to bake due to the fact that once you have measured and mixed the ingredients, you just need to press it into a baking dish or mould. What could be easier? See more details of the Silikomart Silicon Easypop moulds here. 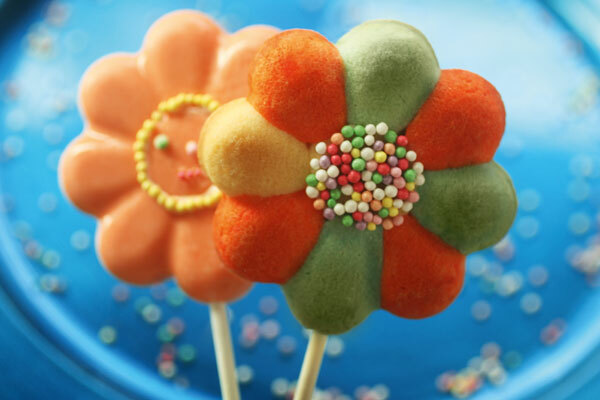 Cookie Pops is one the ways to make the popular treats on a stick. Read more about the Cake Pop Phenomenon here. Preheat the oven to 170 ºC and place Silicomart Easy Pop Moulds of your choice on baking trays. Combine the butter, flours, icing sugar and salt in a mixing bowl by rubbing it between your fingers until it looks like breadcrumbs. Add the flavouring of your choice and a few drops water if necessary and knead until it comes together in a ball. Press dough into the holes of each mould until it is level and smooth the top. Bake for 10 to 20 minutes, depending on the size of the moulds,or until the biscuits are pale golden. Remove the moulds from the oven and set aside to cool before removing the biscuits from the mould. Transfer the biscuits to a cooling rack to cool completely. Place the chocolate in a heatproof bowl and place it over a saucepan of simmering water. Once the chocolate has melted, remove it from the heat and stir until smooth and glossy. Taking one biscuit at a time, dip one half of each biscuit in the melted chocolate and place it on a baking tray lined with a Wizbake baking tray to set. Sprinkle with Hundreds & Thousands while the chocolate is still soft. Once all the biscuits have been dipped in the chocolate, turn the biscuits over and attach the sticks by dipping the sticks in melted chocolate and laying a stick on the chocolate-covered half of the biscuits. Refrigerate to set. Follow the same steps above if you prefer to use Royal Icing for dipping (recipe below). Beat the egg white and the lemon juice in the bowl of a stand mixer until combined. Or use a mixing bowl and an electric hand mixer. Add the icing sugar and beat on a low speed until combined and smooth. 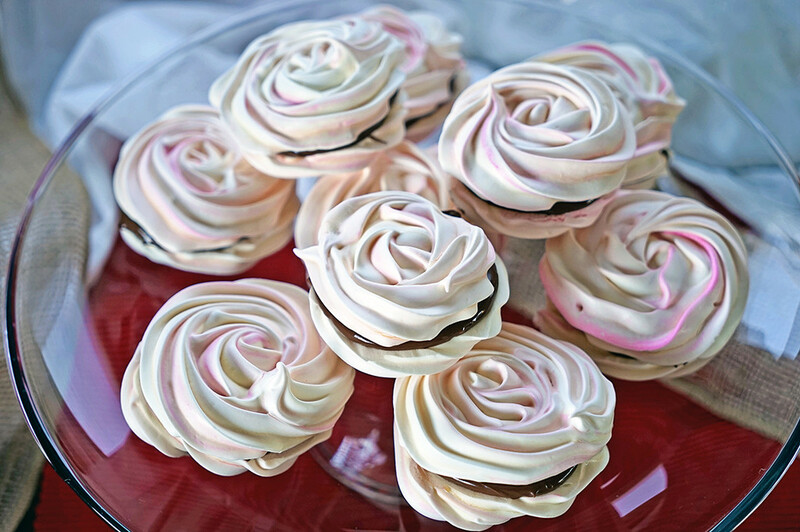 The icing must be meringue-like and of piping consistency. When you lift the beater, the ribbon of icing that falls back into the bowl must remain on the surface for a few seconds before disappearing. Another test is to take a cookie and place a small amount of icing in the center of the cookie. Using a small knife, push the icing to the edge of the cookie. If the icing runs off the edge, thicken the icing by adding a little more icing sugar. If the icing is too thick, add a little water. Add food colouring of your choice and transfer the icing to a piping bag with a small plain tip. If the icing is not going to be used immediately, transfer it to an airtight container as it will harden when exposed to air. Pipe a border around the outside edges of the cake pops. Let it dry completely before covering the surface of the cake pops with the icing. Cover the icing when not in use. Be sure to let the icing dry completely before storing the cake pops. This may take several hours. Store the cake pops between layers of wax paper for the best results. The cake pops will keep several days in an airtight container. This healthier version of cheese cake is creamy, light and lemony. Serve as is or with fruit coulis or fresh fruit. 250 ml fruit coulis, e.g. blueberry, strawberry, etc. Pre-heat the oven to 150 º C.
Lightly butter a 22 cm spring form cake tin. Sprinkle a little flour into the tin and shake to spread evenly. Pour out the excess flour. Alternatively line the tin with baking paper. Combine all the ingredients in a large mixing bowl and mix well with a large spoon or electric hand mixer. Spoon the mixture into the prepared tin or dish. Bake for 90 minutes until golden in colour and firm to the touch. A toothpick inserted into the middle of the cake must come out clean. Set the cake aside to cool in the tin. Cover with clingwrap and refrigerate for a least 1 hour. Remove the outer ring and transfer the cake to a serving platter or cake stand. 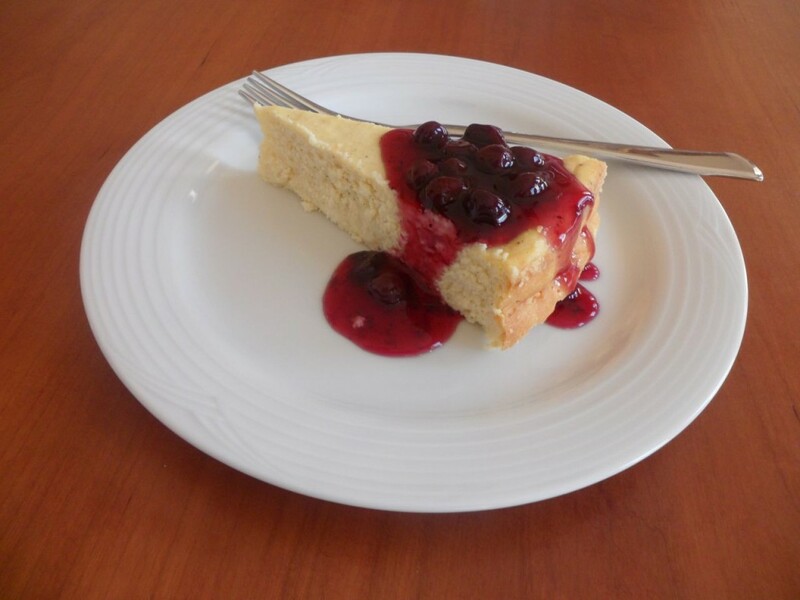 The cheesecake can also be baked in a greased ovenproof dish with a 1.5 liter capacity.